Bowflex machines are meant to allow you to workout without having to go to the gym. If you plan to workout regularly, getting a Bowflex home gym can be a good investment that saves money in the long run. In the following article, we will compare Bowflex Revolution vs Ultimate 2. Seeing the prices, these are indeed more of high-end options. Bowflex Revolution differs from many other models because it comes with two individual high pulleys instead of a lat tower. On the other hand, Bowflex Ultimate 2 offers a higher resistance which can be upgraded to a higher level as well. See more details on Bowflex Revolution and Bowflex Ultimate 2 below. Just like many other Bowflex models, Bowflex Revolution and Bowflex Ultimate 2 have a maximum user weight of 300 lbs. They are highly durable. These home gyms are quite large and heavy, so they will probably take a permanent space in the room. Both models have horizontal platforms, but their benches are foldable to save space when not in use. Bowflex Revolution is larger. This home gym measures 120” long and 84” wide. On the other hand, Bowflex Ultimate 2 requires less surface area as it only measures 112” long and 78” wide. One of the major differences between Bowflex Revolution vs Ultimate 2 is the resistance. Bowflex Revolution uses the Spiraflex system, which offers progressive resistance in all positions in the range of motion. Hence, the resistance is smoother and more even in all directions. However, it only comes with a 220-lbs resistance, and is only upgradeable to 300-lbs. On the other hand, Bowflex Ultimate 2 still uses the Power Rod system which also provides progressive resistance but only in a specific direction. It comes with a higher resistance, which is 310-lbs. This is perhaps a little bit too heavy for beginners. But it can be upgraded to 410-lbs, which is great if you plan to go that far. 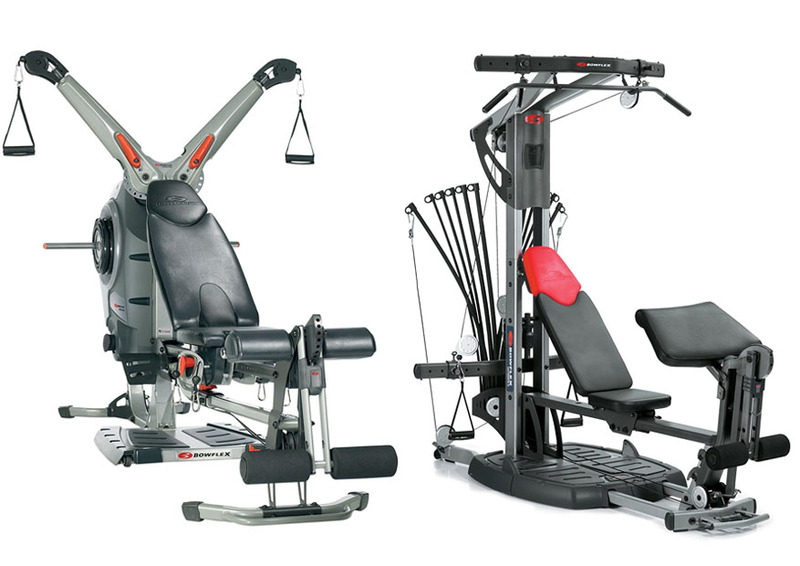 As mentioned above, one of the most noticeable differences between these two models is that Bowflex Revolution comes with a pair of high pulleys, whereas Bowflex Ultimate 2 comes with a lat tower. Both types of tools are meant to train and strengthen the arms. Bowflex Revolution’s high pulleys can train the upper back and also specifically train your non-dominant hand. Meanwhile, Bowflex Ultimate 2’s lat tower is great for the overall upper-body strength. Bowflex Revolution has more built-in exercises, with a total of 100 exercises. It has more exercises for the shoulders, abs, arms, chest, and back, but it has fewer leg exercises. On the other hand, Bowflex Ultimate 2 only has 95 built-in exercises but there are more leg exercises. - Folds to a compact size (44 by 46 inches); recommended workout area of 9' 4" x 6' 6"
Bowflex Revolution is more recommended, especially for beginners. The resistance system is better. This model also has more built-in exercises. You can use the individual high pulleys to train both arms or a specific arm. However, if you want to upgrade the resistance to 410-lbs, Bowflex Ultimate 2 should be your choice.